One piece design - No buckles or clips. Elastic wrist leash to absorb impact shock. 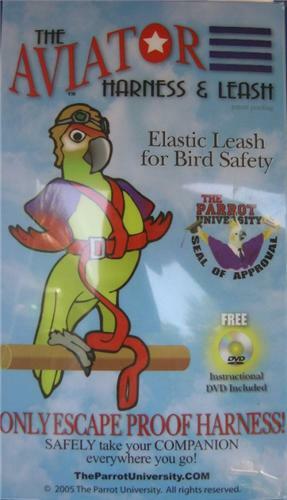 Self-adjusting leash - Adjusts as bird climbs or flies. Increase flying distance by connecting to FLIGHT LINE or retractable cord leash. Available in 6 sizes. Cockatiels through Macaws. Installation and safe use of the AVIATOR. Training your pet to love the AVIATOR. Teaching old birds new tricks. Teaching your bird to fly outside with the AVIATOR. Positive personality changes to expect.